Excerpted from 'Alienated America' by Timothy P. Carney. Copyright 2019 by Timothy P. Carney. Published with permission from Harper Books and HarperCollins Publishers. “The American Dream” as a phrase connotes that there is something exceptional and particular to the United States. It’s something other countries don’t have, at least in the way we have it. The American Dream involves a story that we tell about ourselves, and that we believe makes us special. One special story we tell, particularly regarding our immigrants, is the story of social mobility. In school, we read our Jane Austen and George Eliot and roll our eyes at how stultified and regimented is the empire from which we broke. In America, more than anywhere else, you can become what you want to become regardless of where you started out. It’s easy to fall into materialistic thinking here, and to view this mobility as a purely economic phenomenon. That would be a mistake. You cannot understand the American Dream and American economic mobility if you look at them as matters of dollars and cents. There’s another American peculiarity behind them, and Alexis de Tocqueville noted it a few hundred years ago. These two defining characteristics of America—our “associations” and our economic and social mobility—are married. Economist Raj Chetty found that the places with high upward mobility tended to have high social capital, even when you control for other factors. That is, if you measure the number of community institutions, churches, and bowling leagues, along with the amount of volunteering, the political involvement, and the amount of charitable giving, you can predict the type of place where a child born in poverty could rise up the ranks. America is the land of opportunity because America is the land of civil society. The American Dream of mobility is alive to the extent that the American Dream of robust local community is alive. For nearly two generations, this Dream has been fading. The early 1960s were probably the peak of civil society, Robert Putnam found in Bowling Alone. After that came the decline in civic involvement. Since then, fewer people have been joining clubs, parishes, or associations of any kind, and people who are still joining some institutions are joining fewer. Putnam’s book title connoted the collapse of bowling leagues, once a staple of middle-class America. Their disappearance left Americans bowling by themselves. Alongside informal civil society are the formal institutions of civil society. Putnam charted serious drop-offs in participation in these institutions. Fewer people now attend local government or school meetings. Fewer serve as officers of some organization or serve on some local committee. Updating Putnam’s work in 2017, Senator Mike Lee’s office studied the state of “associational life.” This study found similar results, and others studies confirm them. “Americans’ growing isolation,” French sociologist Ivaylo Petev wrote more than a decade after Bowling Alone, “is thus corroborated here in the case of extended networks. We see evidence for the decrease of formal and informal ties” across America. People go to church less and less every year. We belong to fewer organizations than our predecessors did. We know our neighbors less than we did a generation or two ago. We vote less than we did a generation or two ago. Men have fewer jobs than they did a generation or two ago. Men are in the labor force less than they were a generation or two ago. Americans marry less than we did in 1960. We have fewer and fewer children every decade. It all adds up to this: Americans are less attached to society, their neighbors, their communities, other humans. Lacking the environment of a strong community, more Americans lack the scaffolding to climb above their starting point. More Americans lack the support structure that they would need to build a family. More Americans lack role models, and they lack roles. They are displaced persons living in their home country, even in their native state or hometown. They are strangers in their own land. Millions of Americans are alienated. In this light, it’s hard to disagree when they say the American Dream is dead. This view struck so much of the pundit class as odd because where we lived, the scaffolding was still there. There was something going on in flyover country that we had missed. In Western Pennsylvania, you’ll see two tellingly divergent economies. Both Pittsburgh and rural Fayette County had been dependent on the steel industry and on coal. Both suffered economically when foreign steel and technological innovation drove the Pittsburgh-area steel industry into the ground. Both suffered again as coal faded into irrelevance under pressure from environmental regulations and competition from cheap natural gas. Yet Pittsburgh is doing pretty well right now, while Fayette County isn’t. This makes it clear that jobs, trade, and economics aren’t the whole story. There’s something outside these things that Pittsburgh has that Fayette County didn’t. The answer is local community. Specifically, it’s institutions of civil society. This is the core of the rural-versus-urban divide. Cities are planted far thicker with institutions of civil society, and so when a few disappear, and the money runs lower, they are more able to maintain community. I saw this at Smitty’s Bar in Uniontown, where I met Dave. His son had died that morning, probably of an overdose. Fayette County, for all its economic woe, has pockets of wealth in “the mountains.” In fact, Fallingwater, the famous Frank Lloyd Wright home, sits on a hillside in the Bear Run Nature Reserve about fifteen miles east of Smitty’s. Because of the mountains, though, it’s at least forty-five minutes’ driving time. And from the average Fayette County community, the wealth of “the mountains” may as well be a world away. The suicide numbers and the overdose numbers in counties like Fayette tell us these are not happy places. Sociologists increasingly have begun measuring happiness through various means. These measures aren’t perfect, but they tell us something. Sure enough, poorer people are less happy, according to these studies. But the sadness here can’t simply be ascribed to economic struggles. People aren’t killing themselves, drinking themselves to death, and overdosing just because their bank accounts are too low. A closer look at the happiness studies turns up even more evidence against the bare economic explanation, and points us toward the root cause. A quick analysis shows a stunning correlation. The states with the highest per capita suicide rate are Wyoming, Alaska, and Montana,12 the three least densely populated states. Washington, D.C., and New Jersey have the lowest suicide rates and the highest popula- tion density. This surface analysis suggests that physical isolation is behind suicide. But we can go deeper. Social scientist Charles Murray, in Coming Apart, found something interesting: The difference between the average poor person’s happiness and the average upper-middle-class person’s happiness could be mostly explained by two factors: marriage and “high social trust.” Add on two more factors—religious observance and satisfaction with one’s work—and you’ve explained almost the entire remainder of the happiness gap. Poor people in America, it seems, are less happy mostly because poorer people are less likely to get married and less likely to have many neighbors and friends they can trust. “There is no inherent barrier to happiness for a person with a low level of education holding a low-skill job,” Murray writes. Sure enough, the 1950s and 1960s had more equality when it came to marriage and neighborly trust. These have become so dramatically unequal only in recent decades. And that helps explain the plague of deaths of despair sweeping America in recent years. It’s a fruit of the disintegration of community. These deaths of despair are symptoms of alienation. Death, then, is a bitter fruit of community disintegration. Broken families and the retreat from marriage are other fruits. Economic woe is present in both of these problems, but it’s not the proximate cause. Alienation is. Do you belong to a strong community? Do you enjoy multiple, dense networks that provide both support and purpose? Do you consider yourself a part of many institutions, like a church, a club, or a cohesive neighborhood? The answer is generally Yes in the Oostburgs and Salt Lake Citys, the Chevy Chases and the Madisons. It’s generally No in the Fayette Counties, the Buchanan Counties, and the Middletowns. Popular story lines would have you believe that the poor in America all hang together, braving material poverty through solidarity and close communities, while the rich, behind their gated mansions and plastic surgery, live isolated, barren lives. There are certainly instances of these in America (there are instances of everything in a country of 325 million). But they are not the norm. This leaves downscale communities without as many guys who can get you a job, without as many examples of success, and without as many people motivated to form and cultivate networks. The result isn’t really working-class networks that are less powerful and less advantageous. The result is the absence of networks among the working class. 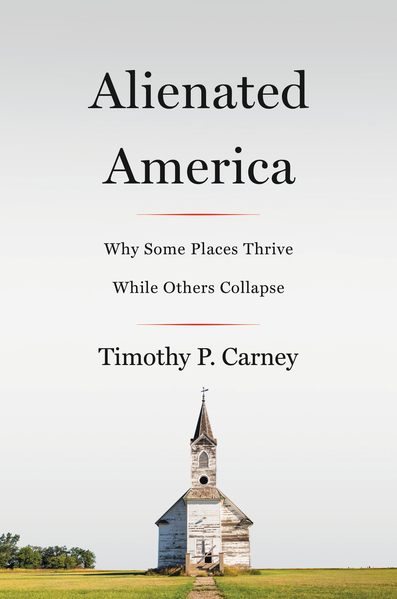 Timothy P. Carney is the commentary editor at the Washington Examiner and a visiting fellow at the American Enterprise Institute.